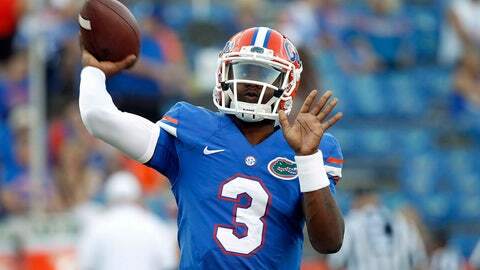 Treon Harris was thrown into a less-than-ideal situation this past Saturday. Facing a top-10 team on the road (in one of the most hostile environments) isn't easy by any stretch. One could see the sophomore signal-caller getting a bit rattled in such an environment. Staying calm and composed, Harris played terrifically in the 35-28 loss at LSU. The Miami native finished 17-of-32 for 271 yards and two touchdowns. Harris took care of the ball and executed multiple throws down the field. Although he rushed for 20 yards on 13 carries, the paltry numbers came in large part to the pressure LSU's front seven was bringing (especially Lewis Neal). Jim McElwain has to be encouraged by the play of Harris. With Will Grier suspended for the foreseeable future, it must be comforting to have a quality option in Harris coming off of the bench. With three winnable conference games remaining, there's a real chance Harris could lead the Gators to an SEC East Division title.